"There's something here," one of the members of the search brigade shouts, "Lucy found something." The rest of the party heads towards where María de la Luz López, Lucy, was digging. She is looking for her daughter Irma Claribel Lamas who disappeared in 2008. On previous searches she has found burned bone fragments, entire skeletons, animal remains, clothes consumed by the elements, and shoes with no owner. She has never found a trace of her daughter. Now Lucy stares at the new bone fragments she has uncovered hidden among the shrubs on the arid land. "This one right here looks like part of a skull," she says. "I even want to take the bones in my hands, hug them and caress them." According to the national authorities there were 24,238 people disappeared in Mexico up until March of this year. The phenomenon is part of the terrible violence associated with both the country's drug wars and the failure of the authorities to address the near complete impunity with which such crimes are carried out, sometimes by state officials. Investigations into what happened to the disappeared are almost never thorough and often non-existent. "It becomes doubly cruel when the authorities do not even bother – or dare – to investigate what happened to your son, daughter, sister, partner or best friend," UN High Commissioner for Human Rights Zeid Ra'ad Al Hussein said of the disappeared while on a visit to Mexico in October during which he met some relatives of the missing. Some relatives feel their only hope of ever finding their loved ones is to look for them themselves, even if this means spending almost all their free time digging holes in the desert. Lucy and her search party are looking for people disappeared from the northern state of Coahuila from where authorities put the number of missing at 1,429 people. 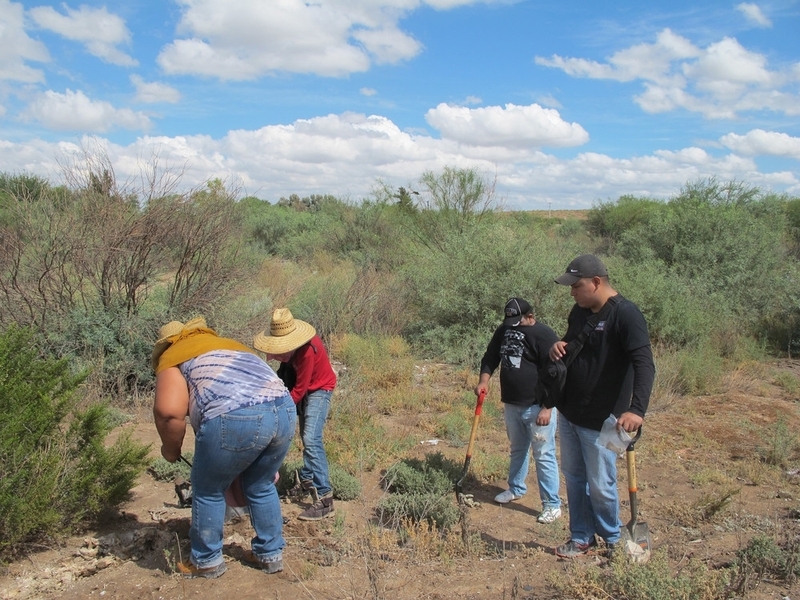 The group is lead by Silvia Ortiz and her husband Oscar Sánchez Viesca, who every Saturday morning borrow two pickup trucks — one belongs to a priest and the other to a friend — and head for the desert on the outskirts of the city of Torreón where they live. The couple are searching for their daughter who did not come home from a basketball game on November 5, 2014. In January this year they united with other relatives looking for their loved ones in the area both in order to pool resources and give each other moral support. They call themselves Victims in Action for Their Disappeared, going by the Spanish acronym VIDA which means "life." The group usually heads for places in the desert about which they have heard rumours suggesting there may be clandestine graves. They look for geographical anomalies on the surface such as loose soil, unearthed rocks, unnatural changes in the levels of the land, and trash perhaps left behind by people who dug a hole. They say that some of their expeditions have lead to the finding of beheaded bodies and handcuffed corpses in mass graves. "We found little fingers, teeth, molars, spine bones, I mean, lots of bones," says Chuy, Lucy's husband. Once they found 80 barrels which they believe were used to got rid of human bodies by burning them or using acid to dissolve the corpses. "It was a graveyard, it was all oily because they used diesel [to burn the bodies]," Lucy says. "We only had to put the shovel in the ground to get more bones." The group says the authorities accompany them on their searches sometimes for security reasons and in case they find something. But it is the relatives of the missing who carry the shovels and do the digging. "No one is going to search with as much love as us, because any of the remains could belong to one of our relatives," says Lucy. "They [the authorities] are not prepared to do this job. They take no care." The VIDA group has received some training from state forensic experts, but they say that it is their weekend trips that have honed their detective skills and forensic minds. It involves a lot of walking, looking at the ground all the way, seeking any sign that somewhere, at some point, somebody dumped or buried a man, a woman or a child. It involves observing the wider scenery and playing out scenarios of what might have gone on there. It involves a lot of pain. It involves stopping, taking a breath, gathering strength, and then walking on. Even when they find remains and hand them over to the authorities it takes many months before they get a result of forensic tests, if any ever arrive. The Mexican government has not created a trustworthy national citizen registry for missing people, neither does it have a complete DNA database to identify the located remains. Furthermore, the Attorney General's office does not have enough forensic personnel to deal with the situation, or with the needed expertise to solve the crisis. The group typically returns to Silvia's house after its days searching in the desert — its members tired, sunburnt, and exhausted both mentally and physically. "I get here okay, but very tired. But I want to continue doing this. It's not only about my daughter anymore. I know what pain and suffering are," Silvia says. "Sometimes we cry, others we don't." On one recent evening the group, beer in hand, sits down to discuss the day's search and talks about other possible locations. A person, a body, cannot simply disappear, they say. It has to be somewhere. As times goes by, a new member called Cuitláhuac whose brother disappeared five years ago, begins speaking about his life. It's as if he hasn't spoken to anyone for years. He tells them his relatives have asked him to stop searching but, he says, he won't give up.